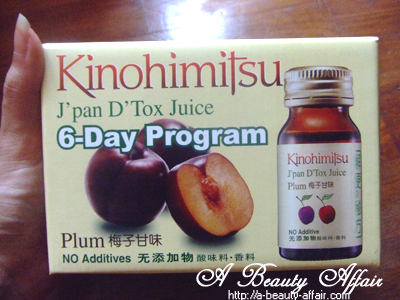 "In just six days, Kinohimitsu J’pan D’tox Juice leaves you feeling renewed, refreshed and revitalized. The six day program is a smart way to flush out toxins from your bowel within 2-4 hours, without disrupting your daily life." Shake well before drinking. 1 bottle each time, preferably after food. Taste excellent when chilled. 1 bottle a day, consecutively for 6 day. 1-3 bottles per week, or as needed. Kinohimitsu J’pan D’tox Juice once consumed, is easily and immediately absorbed by the body. It replenishes hydration, moistures colon and its hard feaces in just minutes. It induces smooth motion within 2-4 hours. The results is FAST! Kinohimitsu J’pan D’tox Juice will constantly promotes peristalsis of colon, improves irregular bowel while soften and unplugged mucoid plague (gluey, old, harden feaces/soil that is coated onto intestine wall) from colon. 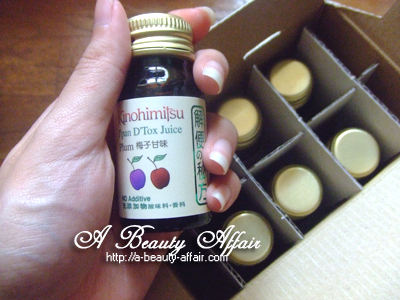 And bet you'll be delighted to know that each bottle of Kinohimitsu J’pan D’Tox Juice is equalivent to 36 plums, 28 blueberries and 15 blackberries! OMG! Imagine the amount of antioxidants you are getting in 1 little bottle! Plums are an excellent source of fiber, vitamin A, calcium, magnesium, iron and potassium. Contains diverse range of micronutrients, with notably high levels of the essential dietary mineral iron, and antioxidant vitamins C and E .
It help in anti-aging, increasing body defenses & metabolism, eliminating fatigue and help prevent urinary tract infections. It is known to contain polyphenol antioxidants (a type of antioxidant) that can up regulate certain beneficial metabolic processes in our body. Blackberries are a fairly good source of iron and vitamin C.
It is famous for its high nutritional and medicinal values. Roselle is also reported to be used as treatment for several diseases such as hypertension and urinary tract infections. It offers us a multitude of benefits through many products we consume or use in our daily life. It whets the appetite, satisfies the palate, refreshes us and offers a welcome respite to everyday stress. is sugar substitute often used in diet foods (including diet drinks and ice cream) and sugar-free chewing gum. It is occurring naturally in many stone fruits and berries. is also commonly been used as a sweetener for people with diabetes. Since mannitol has a negative heat of solution, it is used as a sweetener in "breath-freshening" candies, the cooling effect adding to the fresh feel. Kinohimitsu Drinks are available at Watsons, Guardian, SASA, Nishino Pharmacies, John Little, Robinsons, ALT, Natural/Organic Stores and Individual Pharmacies. It is recommended that you take 6 bottles consecutively for the first time. However, after that you may consume 1-3 bottles a week. And if you happen to have serious constipation, you may take 2 bottles at time. I happen to experience constipation sometimes; I'm ashamed to admit that I do not have regular daily bowel movements. However, this past 6 days has been pretty smooth which I believe that it could be with the help of the Kinohimitsu J'pan D'Tox Juice. I would take the drink after a meal and sometimes I will feel alittle gassy within 2 hours. Bowel movement starts after that, so I suggest that you drink this at home and not bring it out to consume. You won't wanna be going around farting, right? Even though, there were a day or two during the program where I didn't eliminate any waste at all. I still think that the Kinohimitsu J'pan D'Tox Juice did help with some detoxification. The past week was a hectic one for me due to a trade exhibition where I spent 8 hours mostly standing or walking around. And add on the networking sessions and dinners after that. But luckily, I had the Kinohimitsu J'pan D'Tox Juice to keep me going. Despite not having sufficient rest, I didn't feel very lethargic each day. However, I feel that perhaps I may need more than just 6 bottles. As it is stated on the website that different people may react differently due to absorption capability of the body. So one should continue the 6-Day Program before seeing results. Overall, it was a positive experience for me and I might just grab a few more bottles to continue detoxing. Now, you may stand a chance to win a box of 6 bottles of J'pan D'Tox Juice too in either Plum or Cranberry flavor. 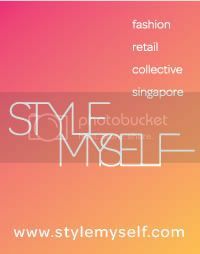 1) LIKE MY FACEBOOK PAGE! CLICK HERE!